New Delhi: A National Conference on “Deendayal Disabled Rehabilitation Scheme (DDRS)”was inaugurated today by the Union Minister of Social Justice & EmpowermentShriThaawarchandGehlothere today. He delivered the key note address on the detailed account of the scheme. The Conference was organised by theDepartment of Empowerment of Persons with Disabilities (DEPwD), Ministry of Social Justice and Empowerment. Minister of State for Social Justice and Empowerment Shri RamdasAthawale, Secretary, DEPwD Smt. ShakuntalaDoleyGamlin, senior officers of the Ministry and about 600 delegates from across the country participated in the conference. The objective of the conference was to sensitize the stakeholders of the scheme i.e. Programme Implementing Agencies (PIAs), District level officers & State Government officers. Earlier the DEPwDorganizedthree Regional Conferences at Secunderabad on 22.12.2018, Mumbai on 17.01.2019 and Kolkata on 18.02.2019 covering the Southern, Western, Central, Eastern and North-Eastern regions of the country. Delivering inaugural address, Shri Gehlot said that the “7th Guinness Book of World Record” has been created by DEPwD yesterday at Bharuch, Gujarat where ‘Modern Artificial Limbs (Legs)’ wereimplanted on 260Divyangjans within eight hours. DEPwD has already created Six World Records in other categories. It is a very proud moment for the DEPwD as well as for all Divyangjans of our country. He expressed his happiness that ISLRTC under DEPwD has recently prepared a Directory comprising 6000 words for the hearing impaired Divyangjans and more than 1700 visually impaired children have been treated with Cochlear Implant Surgery and almost all of them are now leading a normal life. DEPwD has also provided ‘Motorized Tricycles’ to the Divyangjans nationwide for their smooth movement and Department of Transport is helping them. He announced that so far, 28 States have provided ‘Universal ID Cards’ to around 13 Lakh Divyangjansand very soon it will be provided to all Divyangjans of the country. He dwelt upon many new initiatives and achievements of the DEPwD and Ministry of Social Justice and Empowerment for betterment and welfare of Divyangjans and downtrodden people of our country. Shri Gehlot opined that the NGOs and Self Help Groups play a very important role in the proper implementation of the government schemes. When government’s welfare schemes get decentralized, these schemes succeed more. He said that the recommendations of such conferences are sent to the Policy Planning authorities of the government to frame the important policies.He informed the audience that now the official procedures regarding Divyangjan’s certifications and sanctioning of grants have been simplified very much so that Divyangjans and NGOs working for them may not suffer anymore. Shri RamdasAthawale in his address said that the Government is committed to the welfare of Divyangjans and socially backward people of our country. He briefed on many new initiatives and achievements of DEPwD and Ministry of Social Justice and Empowerment. Smt. ShakuntalaDoleyGamlin, Secretary, DEPwD highlighted the need for creation of an inclusive society that accepts and respects persons with disabilities without discrimination. The Programme Implementing Agencies (PIAs) are the partners in the mission of empowerment of persons with disabilities, she added. Dr.Prabodh Seth, Joint Secretary, DEPwDmade a presentation highlighting the provisions of the revised scheme and how to implement the scheme effectively. An ‘Interactive Question & Answer Session’ also held as a part of it, in which queries of the participants were addressed. A few of the organizations who are receiving financial assistance under DDRS shared their views and experience by way of making Presentations. The conference was to disseminate the provisions of the revised scheme and to sensitize various stake holders about it. This conference provided a unique opportunity for interactions amongst all stakeholders to ensure exchange of cross-sectoral views on the aspects of the efficacy of the scheme as well as the scope of improvements in it. Ithad a profound impact on the implementation of the DDRS for the welfare of the Divyangjan. It sensitized the PIAs about the major changes brought about in the revised scheme and created awareness among major stakeholders, viz. State Government and District Level Officers and NGOs in popularizing the scheme further, thereby promoting the well-being of Divyanjans (Persons with Disabilities). 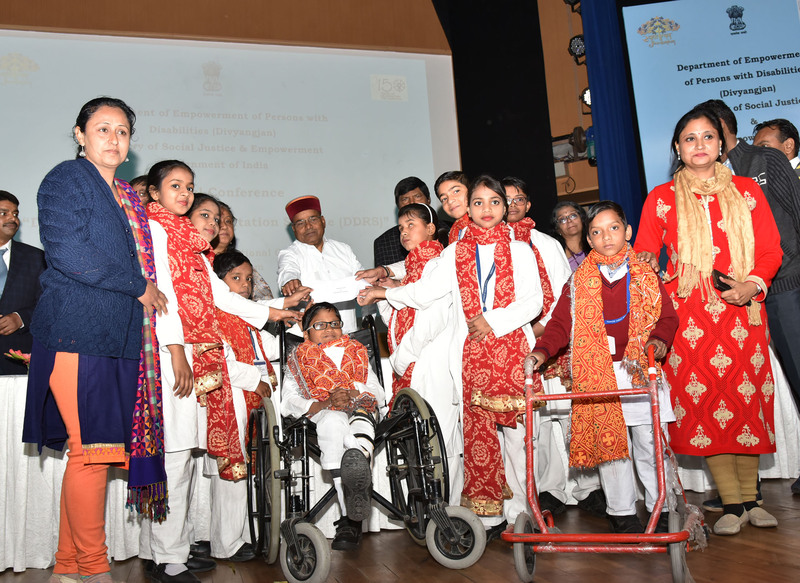 Under theDeendayal Disabled Rehabilitation Scheme, every year more than 600 NGOs are provided with financial assistance for running their projects for the rehabilitation of persons with disabilities such as Special school, pre-school and early intervention, Half-way Homes and Community Based Rehabilitation etc. The NGOs being funded are providing the rehabilitative services to more than 35000 to 40000 beneficiaries every year. In the implementation process of the scheme, the role of State Government is very crucial. The recommendation from the District Social Welfare Officer and State Government is important in release of grant-in-aid. The budget allocation for the year 2018-19 is Rs. 70.00 crores. Although the DDRS Scheme was in existence from 1999, yet a major revamp has been carried out in its provisions with effect from 01.04.2018. The scheme has been revised for making it more impactful for rehabilitation of PwDs. Improvements made in the scheme include increase of honorarium and other cost norms by 2.5 times, streamlining the process of application and processing of proposals, rationalising the number of model projects from 18 to 9, etc.